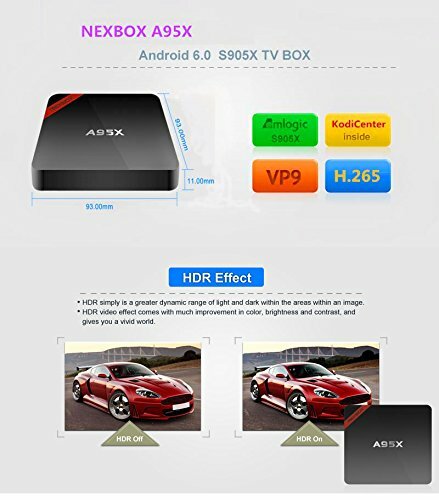 No.1 Android 6.0 TV Box: NEXBOX A95X is the first Android 6.0 TV Box model in 2016. Android 6.0 is to improve user experience compared with other versions of TV Boxes. People can install or uninstall software, games and application programs easily. 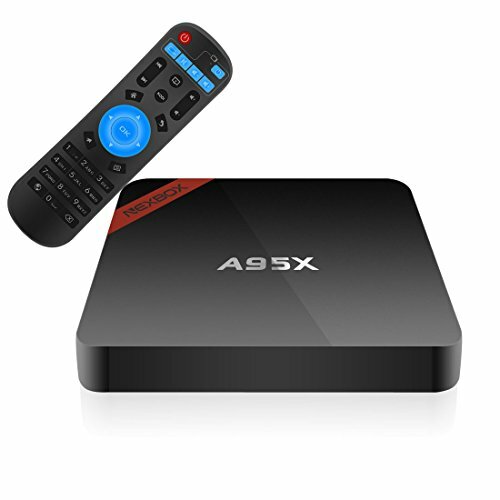 H265 and VP9 decoding: The S905X chipset inside this smart TV Box is a adveanced version compared with the original S905 chipset. It supports both H.265 and VP9 decoding, which are the absolute mainstream decoding formats in the glole. HDR Vivid World: HDR is quickly making its way to TV, first to set-top boxes with NEXBOX A95X TV Box. Watch videos in detail like never before with select HDR content. Witness scenes and characters come to life in vivid contrast, color, and clarity. KodiCenter: KodiCenter, developed by NEXBOX engineer team, is a place where users can find many useful Kodi add-ons for their TV boxes. Hee, you can find an add-on which can help to maintain your Kodi (update, backup and much more), so you can be laways updated with your HD video fun. 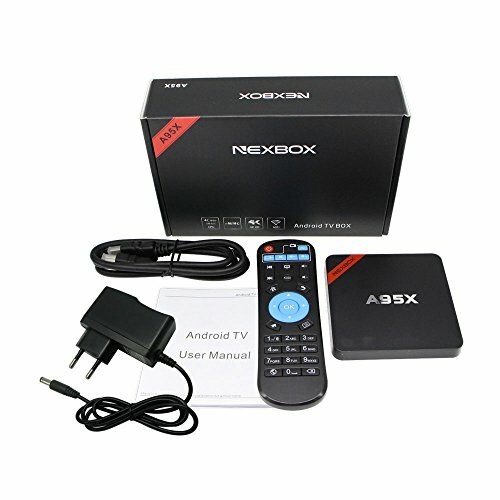 Now today, I’ve got here with me the cheapest box that I could find with this NEXBOX A95X. Now with cheap machines, there are always compromises to be made. It doesn’t matter if it’s an android TV box, if it’s a laptop, a car or anything else. But the question is, are we ready for those compromises? Now despite this, if you are looking for a machine that can play your video library, flawlessly by the way, then this might be an option. On the other hand, if you are looking for something for gaming as well then just forget about this device and go for something else. So here we are with the NEXBOX A95X that features the AMLogic S905, 1GB of DDR3 RAM and 8GB of Flash Storage, with Android Lollipop 5.1.1. Once we open the box, we will find the NEXBOX on the top protected by a plastic envelope, 1 infrared remote control, HDMI cable, power, adapter and a quick user guide, which as I usually say, we don’t need to use it for this device. 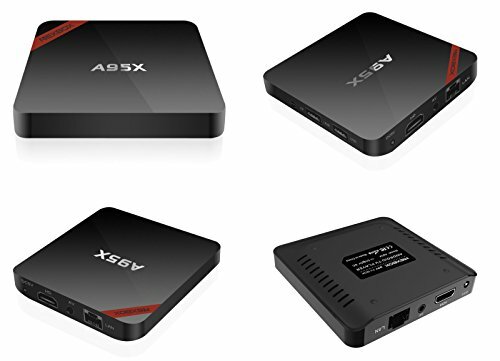 Taking a closer look at it, first of all I would like to mention that this is one of the smallest, if not THE smallest android TV box that we’ve ever tested. It’s really small, especially compared with other machines like the NEXBOX A9. I also compared it with my iPhone 6 and it’s really, really small and lightweight. The plastic and built quality is nothing special, it’s just cheap plastic because this is a cheap machine; it’s one of the cheapest machines, if not the cheapest machine on the market and with the AMLogic S905 it is the cheapest one that I could find. 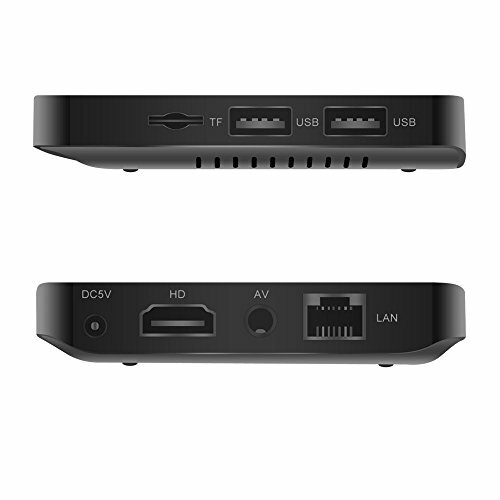 Now regarding the overall design, on the right hand side, we will find 2 USB 2.0 ports and 1 microSD card slot. At the front we have no ports at all, only a very dim blue light when the device is on and it turns red when the device is off. On the left hand side, no ports at all and then at the back we have a power input jack, one HDMI, AV out and a gigabit Ethernet connection. On the bottom we have some cooling vents and on the top, the NEXBOX A95x logo. So, one of the things I would like to mention here is that usually boxes have a rubberized plastic on the bottom but this one doesn’t, so it will slip on any surface, but this is something that you have to decide if it will bother you or not. Now moving on to the launcher, it’s a standard Android launcher that we have seen many times before, so my message here as usual on this kind of machine is just install any launcher of your preference. Just go to the Google Play Store, search for ‘free launchers’ and you will be able to install any launcher that you like. Now regarding the remote control which comes inside the box, the remote control is an infrared remote control and nothing special. 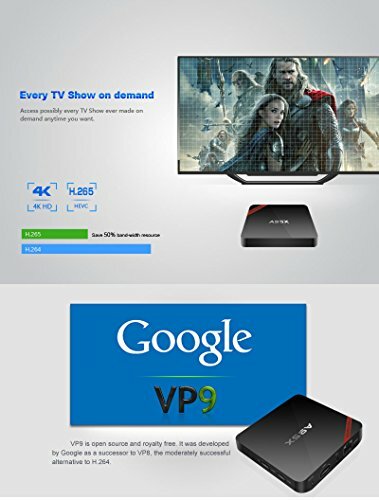 It’s a cheap remote and cheap plastic as this is a cheap android TV box as we said. So nothing wrong with that if we are looking for something on a budget, but my advice here is just check out our review of the Best Wireless Remotes and get one of those. They are cheap also, and you will be able to get a much better experience out of your box. It doesn’t matter which box it is. 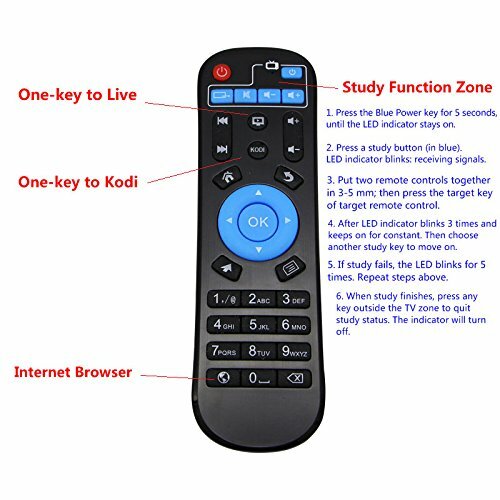 One thing that I would like to mention on this remote for those of you that will purchase this machine and will stay with this remote, is that it is nice and simple to use. You can also copy buttons from other remotes that you have, such as your TV ON/OFF button. It’s not the first remote with that function, but it’s always nice to see that this remote can grab functions from other remotes. You can copy five buttons from other remotes, so that we can use the same remote for the Android TV box and also for our TV which is really nice, but it’s still not a wireless remote, so will have to make sure you are pointing it directly at the box. READ/WRITE: Regarding the disk speed test, we got 55MB/S on Read, which is not bad for a budget machine and 7.2MB/S on Write, which is in line with other budget boxes. Network: In terms of network speed test, we got 44MB on downloads and 20 on upload on the Wi-Fi and then on the Ethernet connection, 95MB on downloads and 20MB on uploads. On Geekbench 3 we got 598 on single-core score and 1739 on multi-core score. AnTuTu with roughly 36000 3D Mark score. So what I can say regarding these benchmarks is that this machine gives us values very similar to other machines with the AMLogic S905. Now one of the things that we have to remind you is that this box has only 1GB of RAM and we have seen other boxes with 2GB of RAM, more expensive of course and this leads me to the next topic which is gaming. As I said in the intro, this is not a machine for gaming. In terms of gaming, the overall experience will not be good even if we have the AMLogic S905, and this is mainly due to the 1GB of RAM that we have, so the machine feels sluggish when gaming. I did try, (well I tried to play 4 games, only 2 would actually play) but I will explain a little bit why it only played two. But the point is that all apps will suffer from the lack of RAM. So, I would not advise this machine for gaming. It also has another problem; it doesn’t have Bluetooth, so I could not plug in my iPad and gamepads through Bluetooth and it doesn’t accept my USB gamepad, the Logitech F710, so I could not play any kind of games. So that’s one of the reasons I said that this machine is not able to play games, because we cannot connect gamepads. The other reason is lack of RAM that makes this machine a bit unstable when we open games. Now on the other hand, if you just want this machine for video playback then this is, as I said on the intro, one of the cheapest options. In terms of video playback it played everything. It comes with a codec 16.1 with a lot of add-ons and things like that. What I usually do is just remove everything and then install a clean installation of codec, but on both versions of codec, it worked flawlessly. It had no issues at all. So if we are looking once again for a cheap machine for movie playback, this is a nice option. I was able to play as usual my library, I’ve got .mkv Blu-ray files up to 20/ 30GB in size, and they played fine. I also played as 4K video, and it played fine with H264 and H265. Finally I wanted to see if it was possible to play 10-bit videos, because all the machines that we tested in the past with S905 were able to. It handled the 10bit 4k just brilliantly. Also I would like to remind that all my files were streamed across my network. Nothing was attached directly through a USB stick or a USB drive, everything from the network. So that shows that the machine has enough power to play video playback while networked. So the takeaway is: gaming on one hand is not the target of this machine, but if you want something really, really, cheap that can play everything that you have, this might not be a bad option at all. So that’s it! Like I said, this is the cheapest AMLogic S905 that we could find. While gaming is a non-runner on this device, video playback is great, and it also has very smooth video playback on KODI. It’s very compact, and while the build quality is not excellent, it’s lightweight, slim, and can easily slot in to any set up you might have. Finally, it’s capable of Airplay both iOS and MacOS to our TV, which is nice. On the things that weren’t so great, it has no Bluetooth, so if you want to connect audio, headset or any game pad which was my objective, you will not be able to. That was one of the things I liked the least, and the other con is that this machine is not capable of playing games. That’s all I can say about this machine, as always, cheap machines have compromises, and these are the compromises that I can find for this box. Cheap box, not suited to gaming, but can handle video and audio playback very well.